Do Upside Down Tomatoes Work? 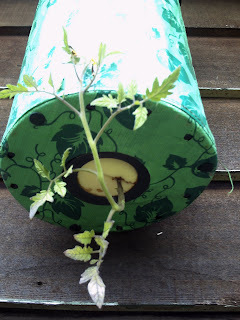 The benifits No Staking - Since the tomatoes are hanging from the planter, you have no need to stake them, or bother with any other types of support other than the planter hanger. Soil Borne Pests - Since the tomato plants don't rest on the ground, you don't have nearly the problems with slugs and other soil borne pests. Soil Borne Disease - SInce you are likely to replenish the soil annually with a planter, problems with diseases lurking in the potting soil are significantly lower. Weeds - Since the planter has very little exposed soil, there are almost no problems with weeds and no need for weeding. Location - The beauty of container gardening is that you can do it almost everywhere. You can hang one of these planters on your apartment or condo balcony, or you can hang it on your patio so you don't have to travel to the garden to get fresh tomatoes for your salad. I found your blog on TrafficNowFire.com. 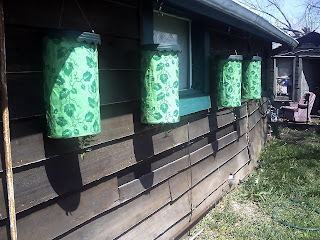 I noticed the picture of your upside down tomato plants. Are the plants growing and do you have more pictures? Yes they are growing nicely yes leve me your email and i will send you some or check back with the blog i will be updateing them reg. Seems like a very sensible and easy to use product and I now know what to get my father for Father's Day. Forgot to leave you my email.